Wheeler led his regiment into several battles, but the most notable was the Battle of Gettysburg, where Wheeler died along with more than 7,000 other troops from both sides. The battle is known as the turning point of the war, a successful though costly thwarting of Confederate forces who were trying to invade the northern states. Wheeler is one of the most celebrated figures in region history, with a Crown Point middle school named in his honor. 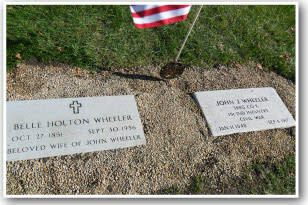 His Crown Point grave rests within feet of a mausoleum containing Lt. John E. Luther, who served as the colonel&apos;s adjutant and who is said to have removed Wheeler&apos;s body from the battlefield. So many soldiers died in Gettysburg that it became a national cemetery, containing the bodies of scores of men who died there. Unlike many of his comrades, Wheeler&apos;s body was returned to his native Crown Point. Before going to war, Wheeler had served as Lake County surveyor and founded a Crown Point newspaper. Some of his descendants still live in the region. A portion of Wheeler&apos;s obituary reads: "In his untimely death, the cause of liberty has lost a noble defender; his children an indulgent father, and his broken hearted widow an affectionate husband." Wheeler is memorialized in wall murals at his namesake Col. John Wheeler Middle School in Crown Point, and his military coat, which he wore at Gettysburg, is on display at the school. A pioneer of Winfield Township and Crown Point, Wise survived the war and returned to the region where he later enlisted with the state militia serving as a captain. As a young man, Wise taught school in Lake and Porter counties and later became a brick maker. Wise&apos;s military lineage traced back to his great-grandfather, who reportedly served in the Maryland cavalry during the Revolutionary War, and his grandfather, who fought the British in the War of 1812. Wise&apos;s company, the Henry Wise Brickyard, produced the 500,000 bricks used in construction of the now historic Old Lake County Courthouse on the downtown square. When he died at age 77, former fellow brickyard workers served as pall bearers and comrades from the John Wheeler Post of the Grand Army of the Republic attended the funeral. Wise is commemorated in a wall mural at the Col. John Wheeler Middle School in Crown Point, showing him adorned in his sergeant&apos;s uniform and depicting construction of the old courthouse. Wise was among 11 Civil War veterans buried at Maplewood whose graves received new granite headstones through the efforts of the Calumet Region Civil War Preservation Project. Known for many charitable acts during her life, Eliza Wise not rests next to her husband, Civil War Sgt. Henry Wise. Eliza died at the Indiana Soldier&apos;s Home in Lafayette, Indiana, in 1927, 10 years after the passing of her husband. Eliza received a new headstone through the efforts of the Calumet Region Civil War Preservation Project. She previously had a concrete pauper&apos;s marker that did not even contain her first name in the inscription. John P. Merrill was the son of Dudley Merrill, a founder and namesake of Merrillville, Indiana -- Crown Point&apos;s neighboring town to the north. John Merrill&apos;s younger brother James also served in the Union Army and was killed at the Battle of the Wilderness. 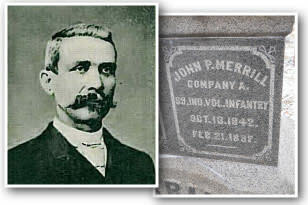 John P. Merrill returned to Lake County after the war, serving as a postmaster in Crown Point, where he died in 1897. 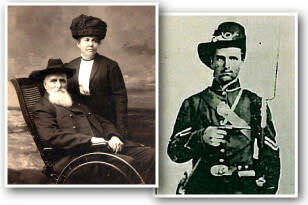 The New History of the 99th Indiana Infantry indicates Merrill regularly attended reunions of the regiment in the decades following the war, often with his daughter, Alta, who is buried near her father. John J. Wheeler was the son of the famous Col. John Wheeler, fallen hero of Gettysburg. Too young to join the Indiana volunteers at the onset of the war, the younger John Wheeler enlisted – a year after his father&apos;s death in battle -- with the 151st Indiana volunteers in 1864 after turning 17. John J. Wheeler returned to Crown Point after the war, eventually following in his father&apos;s editorial footsteps, becoming editor of the Lake County Star newspaper. He is buried next to his wife, Belle Holton Wheeler, and is among 11 veterans at the cemetery whose graves received new granite headstones through the efforts of the Calumet Region Civil War Preservation Project. 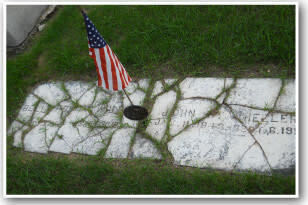 His old gravestone was a thin marble marker that had fractured into more than a dozen pieces. Belle Holton and her husband John J. Wheeler weren&apos;t married until a few years after the war. But as a 10-year-old girl at the beginning of the war in 1861, Belle did her part for the war effort. She was among a group of young girls selected by city leaders to pass out flags and testaments to various companies of soldiers as they marched off to war. Belle received a new granite headstone through generous contributions from readers of The Times of Northwest Indiana. The readers contributed the money to the Calumet Region Civil War Preservation Project in response to a Times article detailing the broken state of Belle&apos;s original marble marker. 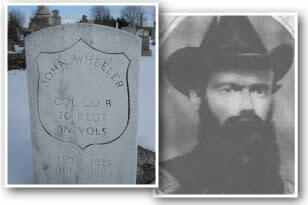 The ashes of Oliver Wheeler, the brother of celebrated Col. John Wheeler, were spread near his memorial marker and the headstone of his brother. 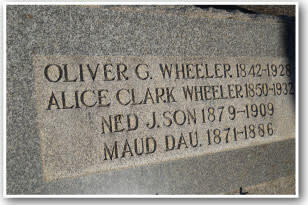 Oliver Wheeler&apos;s marker also is within a few feet of the grave of his brother-in-law, William D. Clark, who served as a corporal under Col. Wheeler. Oliver served in a different regiment than his brother but saw his own share of action. Among other battles, Oliver fought in the famed Battle of Stones River in Murfreesboro, Tennessee, in 1863. He fell ill with typhoid fever after the battle, and his father, Johnson Wheeler, traveled from Crown Point to Tennessee to help nurse his son back to health. During his stay, Johnson also fell ill with typhoid. Both men returned home and were just beginning to feel better in early July of that year when word came of the death of Johnson&apos;s eldest son, Col. John Wheeler, on the battlefields of Gettysburg, Pennsylvania. Johnson, who is buried to the left of Oliver&apos;s marker, wrote about the heart-wrenching loss of John in his autobiography, noting, "It was a heavy stroke for me in my weak condition. 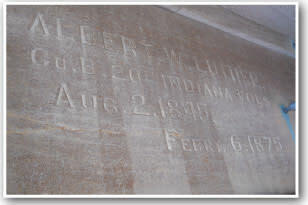 "The Luther Mausoleum – This structure contains the remains of two brothers from the same family and memorial inscriptions for two other Luther brothers who served in the Civil War. The Luther family was a prominent Crown Point family during the Civil War era, with members running local financial institutions and owning large tracts of land. John Luther served under Col. John Wheeler until the colonel&apos;s death on the second day of fighting in the Battle of Gettysburg. News accounts of Luther&apos;s service indicate he was the first man from Crown Point to enlist in the Union army at the war&apos;s onset in 1861. Like Wheeler, whose grave rests within feet of Luther&apos;s, Luther was a prominent Lake County citizen. Following his service in the war, Luther became vice president of First National Bank of Crown Point. At the time of his death from Bright&apos;s diseases at age 85, Luther was thought to be the oldest male resident in Crown Point. He left behind a South Court Street home and farm estate conservatively estimated at $175,000, worth several million dollars by today&apos;s standards. 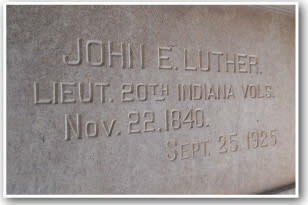 Unlike two of his other brothers who are memorialized on the mausoleum vault panels but not actually buried in the Luther mausoleum, Albert is buried inside the structure with his brother John. They both served together in Company B, a unit of about 100 men raised by John Wheeler to answer then Gov. Oliver Morton&apos;s call for Indiana volunteer regiments. Though his mausoleum burial vault indicates he served as a captain with the 18th U.S. Infantry, this service followed the Civil War itself. Indiana muster records indicate Luther served in the 7th Indiana Cavalry and then in the 3rd U.S. Heavy Artillery during the Civil War. Following the war, he joined the 18th Infantry, serving out west in the Indian Wars. He is actually buried in Boulder, Colorado. Longnecker&apos;s Civil War diary was found in an abandoned Lake County box car. 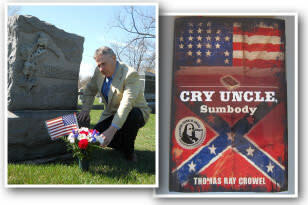 The diary was used at the basis for the historical fiction novel, "Cry Uncle, Sumbody," written by Highland, Indiana, author Thomas Crowel. In 2012, the novel received the Benjamin Franklin Award in the historical fiction category from the Independent Book Publishers Association, a national trade group. Crowel also became a sponsor of the South Shore Civil War Memorial Trail in 2012 by donating his talents and money to the trail preservation efforts. The novel also contains a re-printing of Longnecker’s diary, which includes accounts of battles in which Longnecker fought, wounds he received and his capture and imprisonment in a Confederate prison during part of the war. Sprague died of typhoid fever while in service of the 20th Indiana Infantry. His commanding officer, then Major John Wheeler, paid for Sprague&apos;s body to be embalmed - a relatively new technology for preserving the dead during the Civil War era - and had Sprague shipped back to his family in Crown Point for burial. Wheeler, who became colonel of the 20th, died about a year later at the Battle of Gettysburg. Sprague&apos;s August 1862 obituary in the Crown Point Register indicates he fell ill with typhoid fever on July 4, 1862. The obituary notes he was a favorite among the troops of Company B, winning their respect through his "manly and soldierly deportment." On Aug. 10, 2012 - the 150th anniversary of Sprague&apos;s death in the service of his country - the Calumet Region Civil War Preservation Project marked Sprague&apos;s grave with a special honorary granite marker noting his war-time death. Sprague&apos;s original marble headstone, though considerably worn from the elements, is not eligible for replacement through the U.S. Department of Veterans Affairs because it is a private, not a government-issued, marker. The special marker installed for Sprague - in front of his existing headstone - is one of several purchased for the South Shore Civil War Memorial Trail through a generous grant from the Efroymson Family Fund. 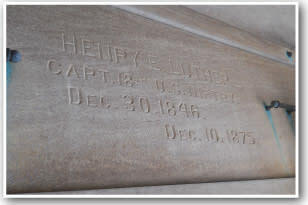 Though memorialized on a vault panel inside the Crown Point mausoleum, Amos and Henry Luther actually are buried in Boulder, Colorado, where they lived at some point following the war. Though little is known about Neff, his grave is located in the pauper&apos;s section of Maplewood Cemetery. 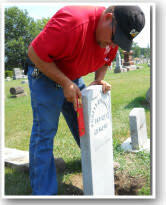 He received a new granite headstone through the efforts of the Calumet Region Civil War Preservation Project. Kale died of typhoid fever in Virginia during the first year of the war. He is one of 11 veterans at the cemetery who received new headstones through the efforts of the Calumet Region Civil War Preservation Project. He also is one of at least three soldiers at the cemetery who died from typhoid, a particularly deadly disease during the Civil War. Disease and infection cost more lives than the battles themselves. Photo: Crown Point excavator Ken Ziese, a Calumet Region Civil War Preservation Project volunteer, assists in the installation of a new headstone for Pvt. Robert Livingston. Livingston served under Col. John Wheeler in the 20th Indiana Infantry, but he did not hail from the same company from which Wheeler originated. Livingston belonged to Company I, which was made up of men from neighboring Porter County Indiana. Wheeler&apos;s original Company B consisted of men from Lake County. Among the many major battles of the Union Army of the Potomac that Livingston would have witnessed was the pivotal and famed Battle of Gettysburg, PA. The Calumet Region Civil War Preservation Project installed a new headstone for Livingston on July 3, 2012, which was the 149th anniversary of the Battle of Gettysburg&apos;s third and final day. The infamous Pickett&apos;s Charge occurred that day in 1863, concluding in a colossal and bloody defeat for Confederate General Robert E. Lee and his Army of Northern Virginia. Though the war continued on until April 1865, the Battle of Gettysburg is hailed as the turning point of the war in which the tide turned in favor of the Union Army. McColly received a new granite headstone through the efforts of the Calumet Region Civil War Preservation Project. Clark&apos;s grave marker is located a few feet behind the tomb of Lt. John E. Luther and a few feet in front of the gravesite of Col. John Wheeler, both of whom he would have followed during his service in Company B. Clark was wounded in battle on June 18, 1864, during the Union assault on Petersburg, Virginia, an engagement that led to more than 11,000 casualties. Outside of his Civil War service, including fighting at the famed Battle of Gettysburg, Clark had worked as a government meat inspector for G.H. Hammond Co.
Foster died of typhoid fever during the war&apos;s third year. Though his family lived in Crown Point, Foster grew up in Pennsylvania and enlisted in a New Jersey regiment during at the onset of the war. A short article in the Crown Point Register in January 1863 notes that a lieutenant from Foster&apos;s company brought his body back to the city for burial that moth. Another news item just below Foster&apos;s death notice announces the return home of Crown Point&apos;s Col. John Wheeler, commander of the 20th Indiana Infantry. That furlough would be Wheeler&apos;s last visit home. The colonel was killed later that July at the Battle of Gettysburg in Pennsylvania. Jergens&apos; May 8, 1908, obituary indicates he was a prisoner at the infamous Andersonville Confederate prison in Georgia. More than 45,000 Union soldiers were imprisoned there between 1864 and 1865, 13,000 of whom died of disease, malnutrition and exposure to the elements, according the National Park Service. Though his name cannot be found on Andersonville prisoner records maintained by the parks, a large portion of his unit was captured by Confederate troops -- and some of them sent to Andersonville -- following a battle near Hillsboro, Ga. Jergens survived his apparent incarceration there and returned to Lake County where he worked as a stock breeder. He died at age 72. Indiana muster records indicate Fowler was a farmer prior to the war and a Crown Point native who belonged to two different regiments during the course of the Civil War. He enlisted in the 73rd Regiment at the age of 17. Fowler&apos;s namesake father was a Lake County founder and served as the county&apos;s second sheriff, according to the younger Fowler&apos;s April 6, 1917, obituary. A carpenter following the war, Fowler retired from the trade in the early 1900s after falling from a building and breaking his arm, which was later amputated. Fowler reportedly died of pneumonia and received ceremonial burial rites from the John Wheeler Post of the Grand Army of the Republic, or G.A.R., fraternal organization, of which he was a member. The Calumet Region Civil War Preservation Project placed a G.A.R. commemorative medallion and flag at the gravesite of Fowler and at least 160 other Civil War veterans buried throughout Lake and Porter Counties. Ross&apos; Indiana muster records show he was discharged from his regiment in Goodman, Miss., under special order 400 from the War Department, though it is unclear in military records what the order stood for. 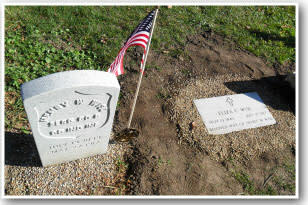 The Calumet Region Civil War Preservation Project is currently researching Needhart and plans to apply to the U.S. Department of Veterans Affairs for a new headstone for his grave in spring 2012. 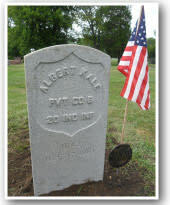 Platt received a new granite headstone through the efforts of the Calumet Region Civil War Preservation Project. Smith received a new granite headstone through the efforts of the Calumet Region Civil War Preservation Project. 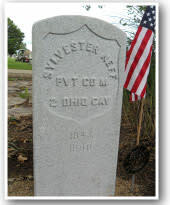 Everts received a new granite headstone through the efforts of the Calumet Region Civil War Preservation Project. 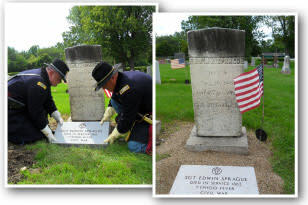 Woods received a new granite headstone through the efforts of the Calumet Region Civil War Preservation Project. Tousley received a new granite headstone through the efforts of the Calumet Region Civil War Preservation Project.